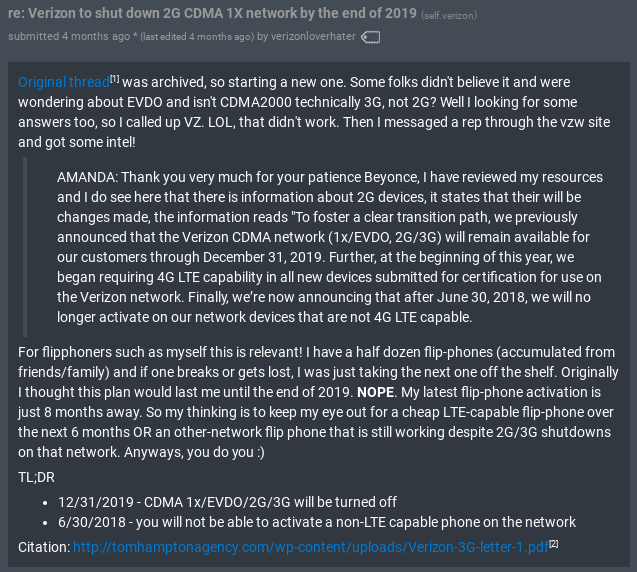 Last week, a HowardForums member posted that he was told privately by two Verizon MVNOs that Verizon will no longer allow the activation non-VoLTE capable phones on its network after June 30, 2018. 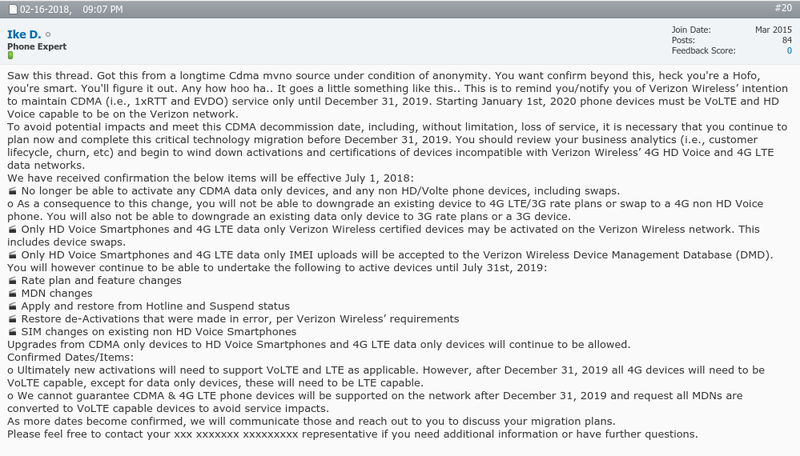 See the screenshot below for a copy of a memo that one MVNO received from Verizon (click the image for a larger version). I'm treating this as a rumor for now, but a credible one. Adding credence to the rumor, four months ago a Verizon support chat transcript (screenshot below) was posted to Reddit. In the chat the Verizon representative confirmed that activation of non-LTE devices would not be allowed after July 30, 2018. I think this chat was regarding data-only IoT devices. 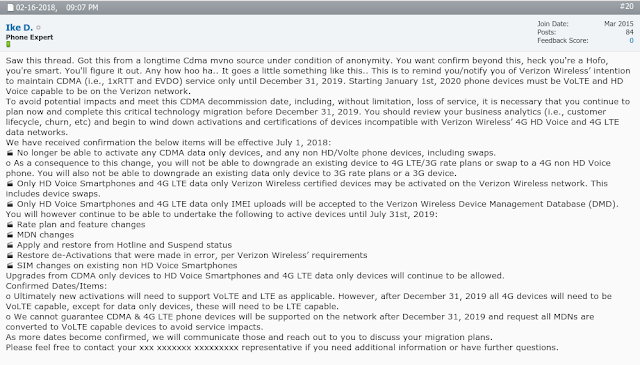 The Reddit post also contains a link to a scan of document on Verizon letterhead that states that Verizon will not activate non-LTE IoT devices after June 30, 2018 . Neither Verizon or any of its MVNOs have announced this change publicly, but that makes sense. Nearly two years ago, Verizon announced that it's planing to shut down its 2G and 3G networks at the end of 2019. That's less than two years away, so now seems like a good time to start blocking devices that will soon become unusable. I can understand the lack of a public announcement too. At some point, Verizon will probably offer customers, especially postpaid customers who still have legacy phones, free VoLTE phones. Verizon is probably waiting until closer to the end of 2019, to notify affected customers so they don't have to give away any more free devices than they have to. The MVNOs and their dealers likely have inventories of 3G only and non VoLTE devices to unload on unsuspecting buyers before making an announcement. For a list of the VoLTE capable phones that Verzion is currently selling, see this page which shows HD Voice capable phones only. Although HD Voice is not VoLTE, Verizon's implementation of HD Voice requires VoLTE. Verizon seems to prefer calling VoLTE, HD Voice, probably to avoid having to explain the technology to its customers. The list of HD Voice (VoLTE) capable phones includes the iPhone 6 and SE and later, the Google Pixels and Verizon branded Android phones released in the last year or so. There's even a VoLTE capable flip phone, the ZTE Cymbal LTE. The HD Voice capable phone page has tabs for postpaid and prepaid phones. Note that the prepaid phones can only be used on Verizon MVNOs after they have been activated on Verizon Prepaid and a required minimum amount of prepaid airtime, typically between $75 and $150, has been added to the account. The postpaid phones must be fully paid for before they can be used on Verizon MVNOs. There's a longer list of VoLTE capable phones listed on the Boom Mobile Verizon MVNO site. Users have reported that VoLTE doesn't currently work on some of the older phones on that list. Other than on Boom Mobile and with a few phones on TracFone MVNOs, VoLTE doesn't currently work on most Verizon MVNOs. I expect that all Verizon MVNOs will eventually support VoLTE (they have to by January 1, 2020), but most will take their sweet time doing it. It's possible that Verizon's announcement to MVNOs is a trial balloon designed to gauge the MVNOs reaction. As there are relatively few VoLTE capable devices available to MVNOs and MVNO dealers, I expect that their will be push back from the MVNOs. Verizon might extend the deadline for non-VoLTE activation, like they did when they blocked "flashed" non-Verizon phones in 2014. Rumor, or not, I recommend that readers avoid purchasing non-VoLTE capable phones for use on Verizon or Verizon MVNOs. For customers who already have non-VoLTE phones, you have until June 30, 2018 to get them on the MVNO you want because starting July 1 you probably won't be able to change them to a different MVNO. Non-VoLTE phones that are in service on June 30, 2018 should continue to work until December 31, 2019 provided the user doesn't allow their service to lapse. I have a Verizon Note 3. It has LTE but is it VOLTE? Will it be able to be activated after the deadline? I don't think the Note 3 supports VoLTE. Check the Boom list (link is in the post) to confirm. The Boom list is from April 2017, glad they keep it updated. @Anon1147, it's amazing sometimes how MVNOs put in more work than the MNOs themselves. Roam Mobility (an MVNO targeting Canadians) used to be my go-to for checking availability of T-Mobile band II HSPA+ when it was a newish thing and GSM phones weren't necessarily jointly UMTS II and IV compatible. Multiple flip phones in my family too on Page Plus Verizon MVNO Maybe time to switch to GSM ATT or T-mobile. Depending on where you are, you may need a voLTE-capable phone on T-Mobile as well. so lemme get this straight regular lte phones can NOT be activated unless they are voice over lte capable? Correct. Because phones would need to be able to make calls, and if LTE is the only network around, they would need to place calls over that network. It's a bit of a scam, IMO. The carrier (MNO, really) has the ultimate say on which phones are allowed to do voLTE on their networks. So does this mean my 82-year-old mother, on Page Plus (because it has the best coverage where she is) will have to give up her beloved flip phone at the end of December 2019? What would be options for Verizon MVNO users who need a simple non smart phone? Right now there's the ZTE Cymbal LTE flip on Verizon Prepaid. MVNOs will probably start offering VoLTE flip phones as the deadline gets closer. I have to figure out which devices are VOLTE compatible and which are not....thanks for the info! Verizon hates flip-phones and non-data devices, and I know this from running multiple indirect stores and having to listen to their greedy, smug corporate reps. I feel for anyone looking to use just a basic phone, because I would never use anything ZTE (or Huawei), and that is all they offer. They all hate low ARPU customers. Them these customers are more trouble than their worth. Can I still keep an elder who is grandfathered in on VZW prepaid $2/day unlimited plan on that plan if activating a new LTE/VoLTE flip like the cymbal? The Cymbal ZTE requires a $30 or higher smartphone plan. If you wait until late 2019, Verizon might offer you a grandfathering deal. Verizon MVNOs should have cost effective low use plans that support VoLTE flips by then too. Some changes have been made to the Walmart bonus data for Verizon Prepaid plans. The $40 plan no longer has bonus data and the $50 plan is getting 9 GB again. I don't see anything about the $60 plan. Verizon has already started turning off CDMA service on some towers. And there are NO towers that have LTE in Alaska. Expect coverage to slowly disappear for non-VoLTE phone customers this year. Actually, Verizon is LTE only in Alaska. Did you mean to say that Verizon has NO towers that have CDMA or EV-DO in Alaska? Just out of curiosity, do older Verizon Prepaid phones have VoLTE? I'm currently educating myself on this subject. I currently have a Galaxy J3(2016 version) and I have a Galaxy J1 as a backup in case the J3 stops working. I know the former is no longer sold in stores and the latter is currently being phased out(I'm seeing it slowly disappear from all of my local retail stores). How can I tell if they have it or not? Sell the J1 unless you want to try to get a free phone from Verizon. J3 supports HD Voice (see above). Some older Verizon Prepaid phones, including the iPhone 6 and later, support VoLTE, but most don't. The Boom page linked above lists the Verizon phones (postpaid and prepaid) that have VoLTE. It's not a perfect list but it's the best we have. On Android phones, you can also check to see if "Advanced Calling" is in the phone's Settings Menu. If it's not there the phone doesn't support VoLTE. Verizon is now testing a plan for customers in Florida who are 55 years old and over that provides a single line of unlimited service for $60 per month or two lines for $80 per month. Vzw declines to say whether it would expand the offering beyond Florida. This is a weak response to the T-Mobile 55+ Tmo One plan, two lines for $60 including all taxes. That plan is not limited to FL, and only one person has to be 55+. T-Mobile says their 55+ plan is selling really well. I just chatted with two different Verizon representatives and they both said that you will be able to activate non-VoLTE phones after July. Seriously, Verizon's reps? Not much better then Tracfone sometimes. Wouldn't trust what they're saying. Ymmv too much. I called one, "oh, there are no plans to do that.. " right. Wow! This is unbelievable. Huge huge news. Thanks for posting, Dennis! Its fair to say then that MOST phones people are currently using on Verizon will no longer be able to be activated as soon as July! How many millions of devices do you figure that is now? Holly crap! On the flip side, this move toward volte SHOULD make it easier for universal phones because all phones would essentially come with the same radio hardware. Verizon will likely continue their history of software lock down, but software can always be cracked! Universal phones? Nah. Watch it go the other way. I'll use T-Mobile's example. For voLTE to work on even factory unlocked phones, those phones have to be approved by T-Mobile for voLTE. And at least at one point, this approval used to cost OEMs money. When Motorola wasn't willing to pay for voLTE certification on one of its unbranded T-Mobile compatible phones, T-Mobile strong armed them into disabling band 12. They didn't want band 12 available even for data usage. ...and yet it is there on low-priced phones like the Moto G 5th. Yeah what harm has the T-Mobile policy caused? None. Maybe T-Mobile VolTE won't work in lower priced phones like BLU, but those are risky junk anyway: best ignored. They are still selling the Verizon Prepaid Samsung Gusto 3 flip phone at BB. Isn't that one a non volte phone ? Yes, the Gusto 3 is 2G only phone. It will stop working in less than 2 years but at least it's only 20 bucks. I was only wondering if Verizon is knocking out 3g seeing that I hardly see 3g I mostly see 1x and lte. TMobile has been shutting down 3g and reusing spectrum to lte. So could we see 3g die before 2g in the states. I was told by a cellular only Verizon rep today that any phone has to say LTE behind it because they're getting rid of all 3-g towers by the end of the year. So he would only show me the phones that say LTE on it luckily there is one flip phone that does. Don't get the flip Cymabal T from Verizon got mine from Total Wireless speaker in back of phone started messing up my voice for other people to hear me,plus speaker location made it hard for me to hear others as well,please learn from me don't buy this phone!!!! You have been warned!! !